Unlike other residential designs, the designer wants to establish a sort of healing forest instead of living in boring box. This project is a nice space for children to live and grow, and also give the adults a tranquil space to stay. The basic spatial tone is made up by the colors of creamy white, white and the dark and light oak colors, which can express a relaxing and natural living field. This project is a kind of living story all about the growth in free imagination and bold innovation. This project also is the designer's experiment to explore the residential issues responding to Nature. There are two interesting natural ideas for this project; the first one is the image of trees that represent the parents' profuse love, and the second one is the nutrition of trees that can foster the children. The curve shapes stretching out to the top of the restaurant and decorated by the hanging lights of the tree branch-like structures, which is the metaphor of a vital big tree that grows up from the ground until reaching the clouds. This metaphor is the main topic of this project, which is a space that contains all imaginations of life and fosters the innovative spirits to freely expand. The project finished in 2016 in Taiwan. In the living room, the set of sofas in front of the large windows can create a space for the spatial users to enjoy overlooking the outside cite images with relaxing feelings. The curve shapes of ceiling are like floating clouds or the magic rugs in fairy tales. With the lights arranged as Orion stars figure on the ceiling, which can inspire the childlike joyfulness from everyone's deep mind. The space is 320 square meters. The space of trees corridor contains the designer's intention to create a living scenario about the interaction between people and trees. 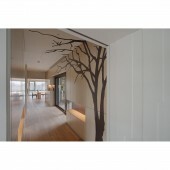 The image of trees is a kind of interface between the space and the spatial users. Leaning back on the wall is just like leaning back on the big tree, which is a kind of scenery of enjoying the refreshing moment under the big tree. In this kind of natural atmosphere, the adults and children can make some daydreams together for releasing the imaging energy. The joyful moments can be fostered within this atmosphere. In the reading and playing room, the special book shelves formed like the crescent moon shapes or the Earth curves can generate interesting postures at the reading moment. The city images freely posted on the white wall represent different kinds of view for this world. All the family members can express and record their different views of this world as they getting through every step of their lives. In the space of this project, everyone will sincerely touch every moment in their lives, and find out the nature of life. SUN TITAN DESIGN ASSOCIATES CO., LTD. The Sunrise Golf & Country Club, where the LPGA designated venue in Taiwan, the adjacent Sunrise Villa, the private clubs in Yangmingshan, the top modern house owned by the celebrity Elephant DEE and Barber Hsu, etc. are the master pieces by Suntitan Design. The architectural exterior and interior design of villas, private clubs, chapel on the water, etc., and the building public facilities and banquet halls from the noted real estate developer Sunrise group are hosted by Suntitan Design. Suntitan considers every design case as the creative spirit of artworks, which apply the pleasant aesthetics to the living environment, and improve the life culture by creativities. 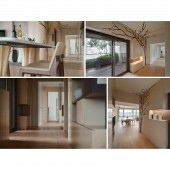 Flying Flying I Wish Interior Design by Chien-Chien Chu is a Nominee in Interior Space and Exhibition Design Category. · Click here to register today inorder to be able to view the profile and other works by Chien-Chien Chu when results are announced. Flying Flying I Wish Interior Design by Chien-Chien Chu is Winner in Interior Space and Exhibition Design Category, 2017 - 2018. · Press Members: Login or Register to request an exclusive interview with Chien-Chien Chu. · Click here to register inorder to view the profile and other works by Chien-Chien Chu. Did you like Chien-Chien Chu's Interior Design? Did you like Flying Flying I Wish Interior Design? Help us create a global awareness for good interior design worldwide. Show your support for Chien-Chien Chu, the creator of great interior design by gifting them a nomination ticket so that we could promote more of their great interior designs.